Planning and food prep can save you time, money and stress. Chef Jen Petrovic shares some smart tips. Meal planning is all about reducing the daily stress of what’s for dinner. When you meal plan, you know what you’re going to cook, so you only buy the ingredients you need, and you’re not thinking about it every day. If you cook your meals from scratch, you also have control over the ingredients, rather than rushing to the shops for expensive, pre-prepared food or ordering in takeaway. It means less stress, less wastage and more time to spend with your family. It only takes 10 minutes a week to plan your meals. Think about your week and which nights are busy and which nights you have more time. Ask your family what they would like, check for ingredients you already have and need to use, and look in your freezer for previously prepared meals. If you have takeaway or eat out once a week, put it in your meal plan and don’t buy food you will never use. Generally you won’t need to cook seven dinner meals each week. We recommend planning to cook four meals from scratch each week, taking a meal or two from the freezer that you’ve prepared earlier (more on that later), and using your leftovers. Once you know your meals, make a shopping list and shop once a week for all the food you need. Make double of all freezable meals, and freeze the other half for a few weeks down the track. A meal taken from the freezer is the ultimate fast food. Plan to use your leftovers. You can have a pot luck night once a week, where everyone has leftovers from previous meals. If you’re low on time, make one of your meals each week super simple – like eggs on toast, salads with leftover roasted vegetables, toasted sandwiches or a simple soup. Plan for one meal each week to be a pantry meal – something you can make almost exclusively from non-perishable ingredients. Think chickpea curry, puttanesca pasta or bean quesadillas. This means if your plans change and you don’t end up cooking on the night, there’s no fresh food going to waste. Marinating meat before it freezes makes for a quick home cooked meal. The meat marinates while freezing and again while defrosting. Then you can barbecue the meat and make a simple salad, and you have a super tasty dinner ready in minutes. Cook in bulk, or make two meals at once if you can. Try to cook meals that have a similar base (like onions, garlic and carrot) at the same time. Many meals have onions as a base, so if time allows, start frying them off along for another night’s meal at the same time. If you have a few minutes in the morning, peel any root vegetables you plan to boil and pop them in a saucepan, cover with water and leave on the stove ready to turn on that night. It’s good to have lots of onions and garlic – we use these in many of our dishes. Pantry ingredients like canned red kidney beans, tinned diced tomatoes, cannellini beans, chick peas, pasta, rice and a few spices (like ground coriander, cumin, turmeric and garam masala) make for easy meals. Greek yoghurt and eggs are also handy to keep in your refrigerator. Frozen peas, beans and corn are great emergency vegetables to accompany any meal. We recommend planting herbs if possible, as it’s cheaper and you only use what you need. For sweet treats, we love to cook berry muffins, banana bread, apple cake or semolina cake, just to name a few ideas. If you make these treats yourself, you have control over the ingredients. Cut any cakes into the right portion sizes for lunchboxes and freeze them, then simply pop one portion into the lunchbox on the day. They will defrost by morning tea. Cooking snacks and then freezing them also gets them off the kitchen bench and away from temptation! For savoury snacks, we have loads of suggestions like bean quesadillas, spanakopita, falafel, or tuna and corn fritters – preferably leftover from previous dinners. Again, cut into single portion sizes and freeze for ease of the morning routine. Homemade hummus and veggie sticks are also the perfect after-school snack. 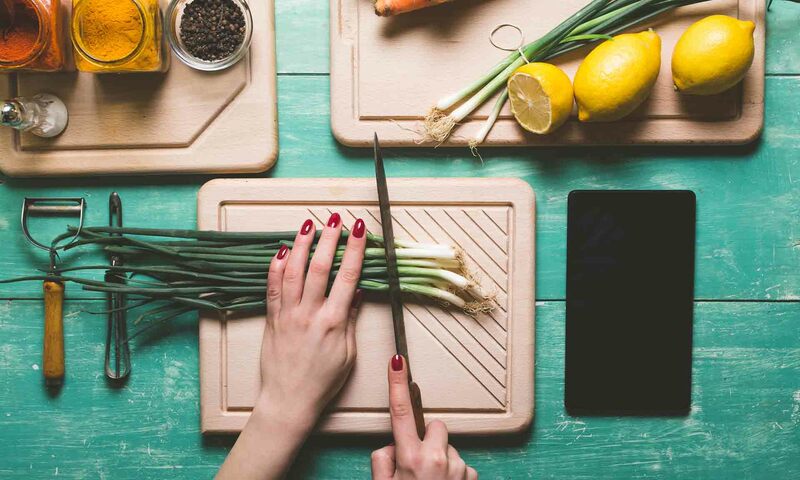 PlanBuyCook is a meal planning app created by Jen Petrovic and Gaby Chapman, and is filled with 130+ everyday recipes for families of all sizes.